Disney Interactive Studios has revealed that those who wish to purchase Epic Mickey: Power of Illusion when it releases on 18th November across North America (the same day as Wii U arrives), have the choice of picking it up in stores or downloading from the Nintendo eShop. It looks like that'll make it the first third-party title in the US to be released both physically and digitally. 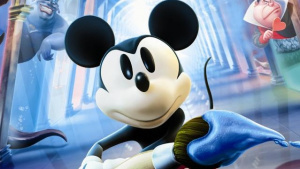 At the time of writing, it is unknown if Epic Mickey: Power of Illusion will be released on the digital store in Europe. We will keep you updated as more news arrives. All future first party titles will be released on the eShop alongside their retail siblings, but it looks like more titles from other publishers will start to follow suit in the coming months. I bet they will! but... at least now i know i have the choice where as i have already bought star fox, super mario 3d land, zelda, pilotwings and mario kart 7 so its worse having to spend that sort of money for something i have already owned where as with this game it wont be so bad. But yeah they really need to sort out there price structure. I would really like to know what the sales figures are for Downloaded titles compared to shop bought ones. Im gonna take a gamble and say the difference is massive like 90% - 10% but maybe im wrong. still getting the physical copy. Shame about this being the Wii U launch day. I'll end up asking for it for Christmas, more than likely. I can not wait for this game!! It's probably my most anticipated title for the year. The day after they put up Star Fox 64 on the eShop, for £40, I went and bought it for £19 in GameStation. These prices will have to change before I ever consider paying such prices for retail games. I'd buy it digital if it was cheaper than physical but there's no chance of that happening. At least it bodes well for future 3rd party retail releases on the eShop, now to get them to release past 3rd party retail games on the eShop... C'mon Tales of the Abyss 3D eShop release! I've been looking forward to this game after playing the Mickey games of yesterday years ago, so physical copy it is. It's too bad that November is the craziest gaming month of my life. This game will have to wait for December, unfortunately. It's ok though, it deserves its own time! I already knew this from the event in June, now where's my KH DDD download? It's one of those games I'd play through and trade in eventually though to finance other games. We're not made of money. @PinkSpider "its worse having to spend that sort of money for something i have already owned"
I haven't rung up Nintendo about it yet, but I'm fairly confident that they haven't demanded everyone re-purchase all their physical games digitally. I don't think it's in the ToS. All yours for a very reasonable price of £39.99.